For price and discount information contact 020 3404 0500 or use the online contact form here. We will give you a free carpet cleaning price quote 24/7. Whenever you are in need of carpet or rug cleaning, stain removal and rejuvenating in Latimer Road W10 just take a couple of minutes of your time and book our professional carpet and rug cleaning service! Our cleaners begin with an inspection of the type of rug or carpet, its condition and the material it is made of. Then thorough hoovering is done, followed by careful testing of the solutions which will be used on a small inconspicuous spot of your carpeting. Any removable stains are pre-treated, and so are the high traffic, soiled areas. Depending on the type of carpet or rug, either dry or steam cleaning is finished. Steam cleaning is a deep shampoo carpet cleaning process done with a powerful hot water extraction machine. 95percent of the water used is extracted back into the machine, so the drying time is only about three hours. The dry cleaning does not require drying time. After the cleaning, upon request, our cleaners can provide a Scotchgard protection treatment or deodorising for your rug or carpet too. If you want to save money and time, you can book one or more of the other services, we provide, so the cleaners can perform them at one visit. We will give you a discount of up to 20% for every other cleaning you order along with the carpet cleaning. The carpet cleaning team can also provide: blinds cleaning, curtain cleaning, drapery cleaning, bed bug mattress treatment and mattress cleaning services. 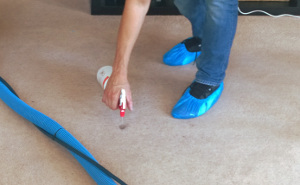 We provide the business owners and people situated in Latimer Road W10 with the top quality deep carpet cleaning in the area. Excellent Carpet Cleaning has been offering professional steam carpet cleaning and dry foam carpet cleaning for over a decade. All of our cleaners are hand-picked after personal recommendations. They are police background checked, experienced and trained in using our modern professional carpet cleaning equipment, tools and solutions. Our prices are fixed and affordable. We will not charge you extra hidden costs. We can clean any type of carpet or rug, and offer carpet stain and spot removal of various stains, such as: oily stains, paint, rust, wine, tea, blood, vomit, coffee and can repair moth damage on your rug or carpet. We can provide one off or regular rug and carpet cleaning for commercial and domestic properties as well. To reserve a time slot for our services, just pick any day of the year and send us an online booking request here or call 020 3404 0500 for that day. Our non-stop customer care service will process and confirm your request in the next 2 hours. Without any deposit for booking. If you order more than one of our services, we will give you quite attractive savings from our prices. Also, if you are a regular customer or book early on, you will receive our preferential prices. So will all landlords and estate agencies in the area of Latimer Road W10. Our prices are fixed and you will not be charged any extra hidden fees once we are done. We accept flexible forms of payment. Just pick a day of the year and book our professional deep carpet and rug cleaning service today to make your carpeting smell, look and feel as good as new!